Description: Special first print bonus disc available only to those who pre-ordered SYNTHESIZED3 from the KonamiStyle web shop before June 9th, 2011. About 55% of the music from the game is presented on the disc. Music composed, arranged, performed, mixed, and mastered by Sota Fujimori. Vocals on "NEO CONTRA" by Paula Terry. Soundtrack published and distributed by beatnation Records and Konami Digital Entertainment. 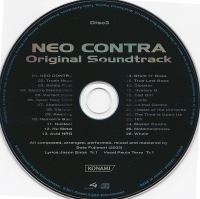 This is a list of VGCollect users who have Neo Contra Original Soundtrack (Pre-Order Item) in their Collection. This is a list of VGCollect users who have Neo Contra Original Soundtrack (Pre-Order Item) in their Sell List. This is a list of VGCollect users who have Neo Contra Original Soundtrack (Pre-Order Item) in their Wish List.